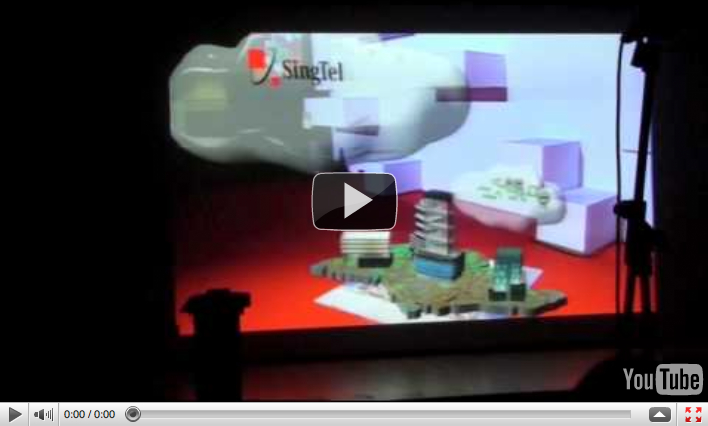 Bill Chang's "Live" Animated 3D Singtel CLOUD at iluminate 2010 | Why You So Free Lately ? Singtel's "on demand & elastic" ICT CLOUD offering was illustrated "live" in an impressive state-of-the-art 3D cinematic animation when Bill Chang was delivering Singtel i.Luminate 2010 Keynote 2: "Powering of the Future Business". Other impressive presentation includes Singtel's demo on their Bandwidth On-demand - a hybrid bandwidth offering for the market. Singtel Cloud subscribers can also scale their bandwidth as and when they need more resources on top of their usual standard plan during peak periods. "In today’s highly competitive global economy, businesses are constantly challenged to be more agile and improve business productivity. With scarce resources, they have to focus on building their core competitive edge for sustainable growth, while lowering their overall costs. The convergence of IT and telecommunications technologies have created new, exciting opportunities that empower businesses to achieve sustainable growth, scale their operations and reduce their costs significantly." Bill Chang, EVP, Business Group shares on how SingTel is capitalising on these technology trends to lead and shape the ICT market and power the future of businesses. Singtel has recently fostered a very strategic alliance with "Best-of-Breed" Silicon Valley vendors like Cisco, EMC & VMWare to build their ICT Cloud infrastructure. Singtel has clearly taken centre stage in the global Cloud arena. Winning Toto Numbers on Leopard Geckos?